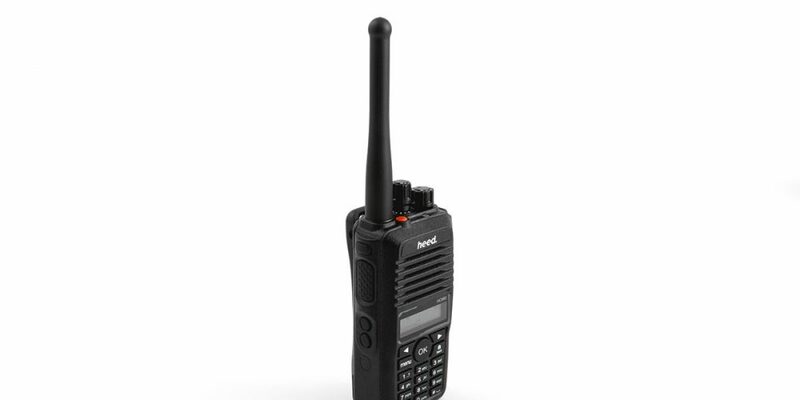 The HC880 is Heed’s flagship dual mode digital/analogue portable two-way radio. Compatible with all major DMR radios (including Motorola and Hytera) and weighing just 270g, the Heed HC880 is the lightest commercial radio in its class. Providing the compatibility of analogue with the unparalleled sophistication of digital communication, the HC880 interface seamlessly integrates voice and data technology to ensure safe, rapid response audio interaction. For professional communication – underpinned by world leading digital technology – the Heed HC880 is at the forefront of two-way radio design. Fast, reliable and with unmatched audio clarity under all conditions, the HC880 is the smart solution for your business. Heed – communicate with confidence. Advanced Applications – Features Heed’s HC880 developed advanced text messaging management settings enabling emergency response and staff safety, dispatch, hotel scheduling and job ticket management. Battery: 1700mah Li-Ion including belt clip. Text Messaging: Send preprogrammed update messages to team members when radio communications need to be delivered without interrupting workers or guests. Emergency signalling: Sends a help signal to predefined person or group. Rugged Design: Tightly sealed against wind and dust, and submersible in up to one meter of water for 30 minutes (IP67). Programmable side buttons: Side buttons can be programmed to enable access to favorite features such as text messaging. Bright sensors: The Radio features functional High definition 45mm Colour LCD Screen dis- play providing feedback on scanning, monitoring or calling features. Includes easy to use full keypad for navigation, easy message and menu navigation.